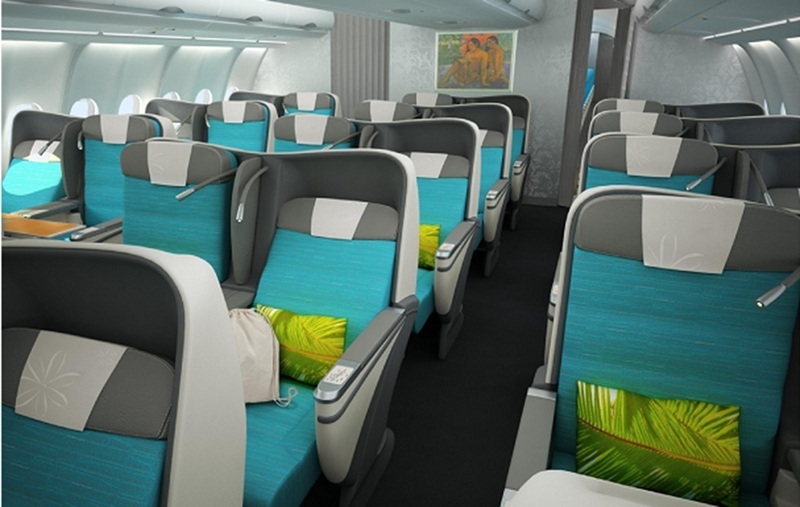 Short on the heels of other Pacific long haul rival Fiji Airways, a designair favourite, Air Tahiti Nui has revealed that it is refitting it’s A340 long haul fleet starting in April this year with a brand new economy and Poerava business class product. Here at thedesignair, we are super excited, as the long trip from Europe in a slightly dated cabin with looping videos were a little bit of a put off to head off to the tropical islands. But now with the launch of this brand new cabin, we are already packing our bags and can’t wait to try the new cabins out for real. 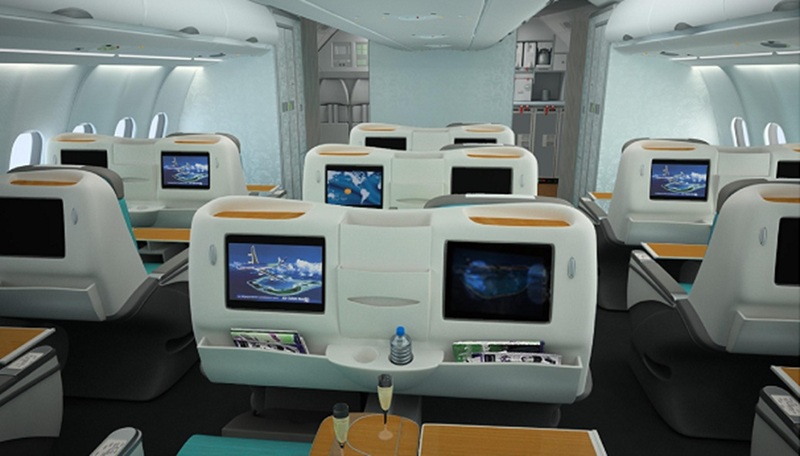 This update will see the removal of their current first class, as the new business class cabin looks like it will outperform both previous premium cabin options. The new business class Sogerma “angled-lie-flat cocoon” seats are a leap forward for the airline (although surprisingly not the fully flat beds that many airlines now provide as standard for their business class). 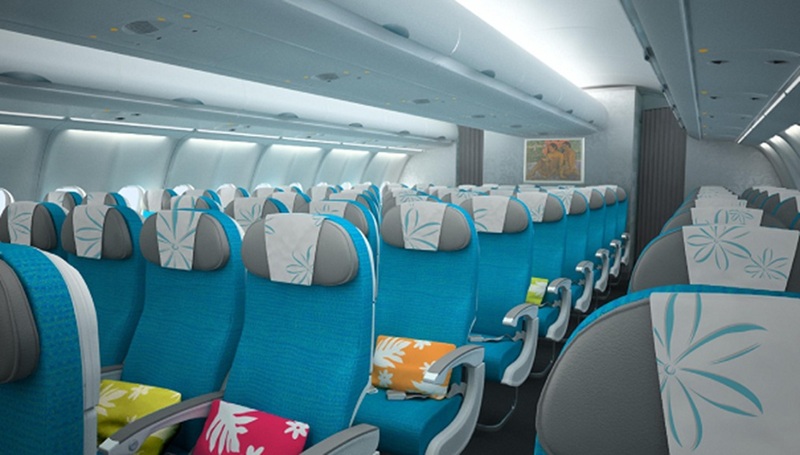 The new seats will provide more personal space, with a 60-inch seat pitch, while continuing to provide a popular two-by-two-by-two configuration, meaning direct aisle access for 2/3rds of the cabin. 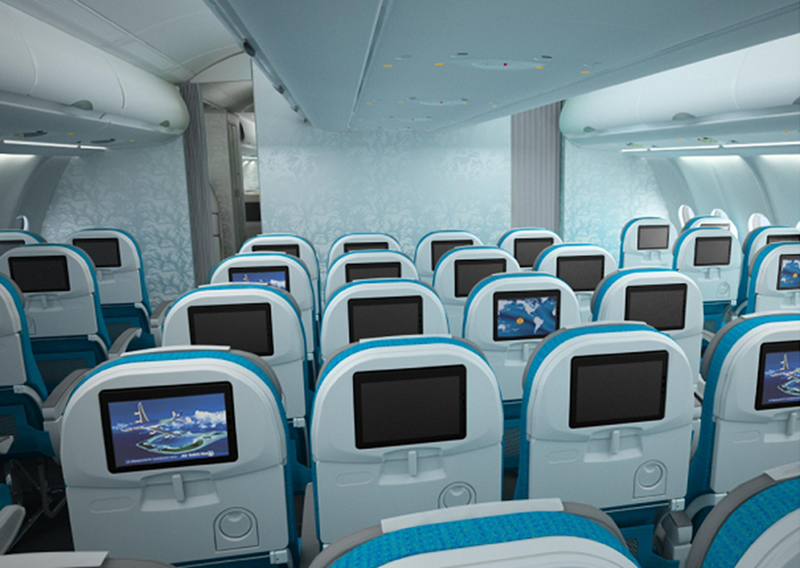 The advanced entertainment system will offer all seats in both cabins feature on-demand touch-screen access to nearly 50 movies and television programs, as well as magazines, games and music. The system also features a Tahiti focused TV channel, “Tiare TV,” inviting passengers to enjoy a taste of their upcoming vacation in Tahiti the moment they step on board. For those in economy, enjoy a new lighter weight seat offering a 2 x 4 x 2 seating configuration (normal for the A340/A330 airframe) with a seat pitch of 32 inches, giving maximum comfort on those long haul flights. 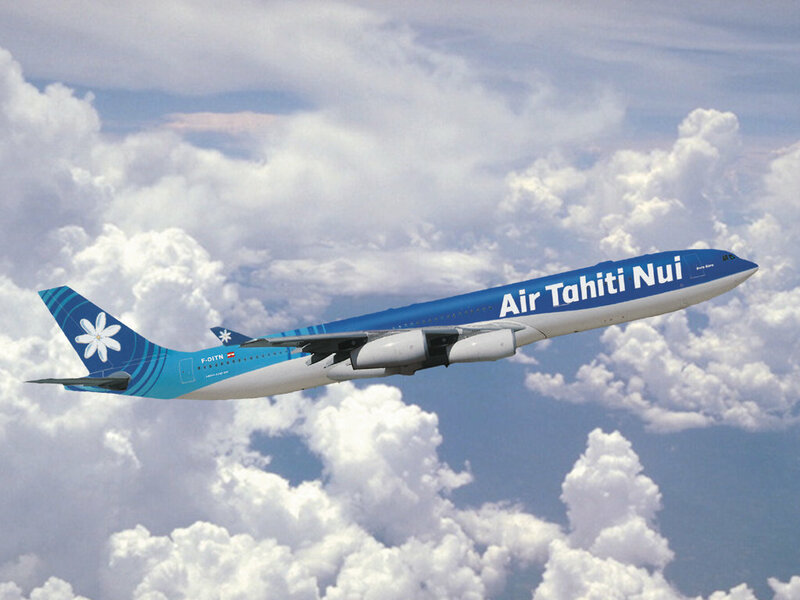 What we are super pleased to see is no announcement (with all the current airline news) to change their livery with the new product launch, as Air Tahiti Nui was one of our favourite modern liveries of last year. Love the colors, the bulkhead design and pillows. They have an excellent soft product and now with this hard product they can match that. A bit picky though, but I hoped they would go for a fully flat seat.